1794 outer letter sheet from Nassau to London with manuscript "5" rating, two-line DEAL/SHIP LETTER handstamp, reverse with arrival cancel over join. Light vertical filing crease, generally clean condition for such an early example. 1810 entire to London bearing fine example of straight-line BAHAMAS handstamp, �2/-� manuscript rate marking at left, reverse with arrival cds together with fine red classical wax seal. 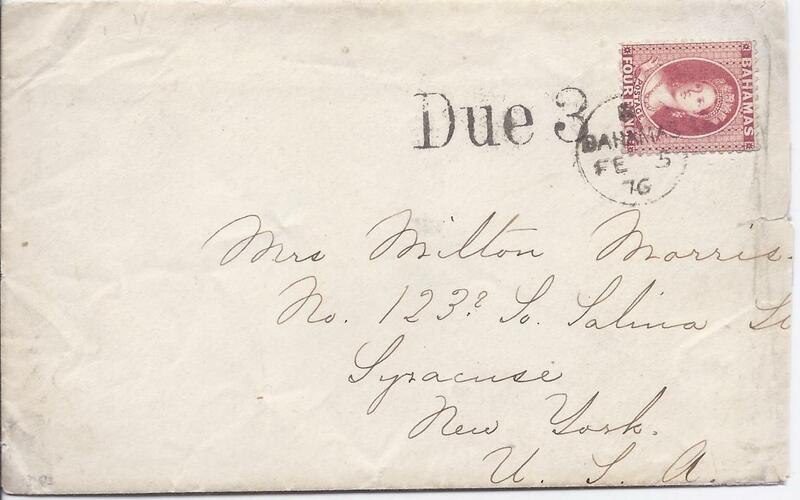 1883 cover to Buffalo, NY, redirected to New Haven bearing single-franking Watermark Crown CA, perf 12 4d. tied by �B� obliterator, this being oversturck by Buffalo cork duplex, reverse with A/Bahamas cds, New York transit, Buffalo transit and arrival cds. 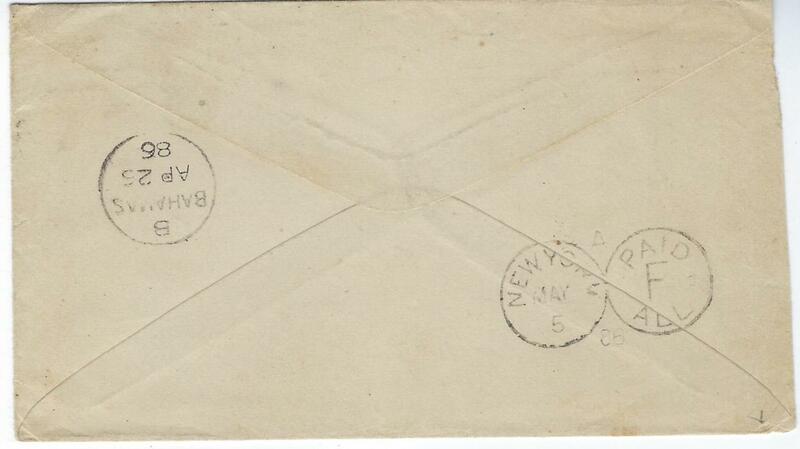 The stamp has rounded bottom right corner and envelope a little roughly opened on reverse. 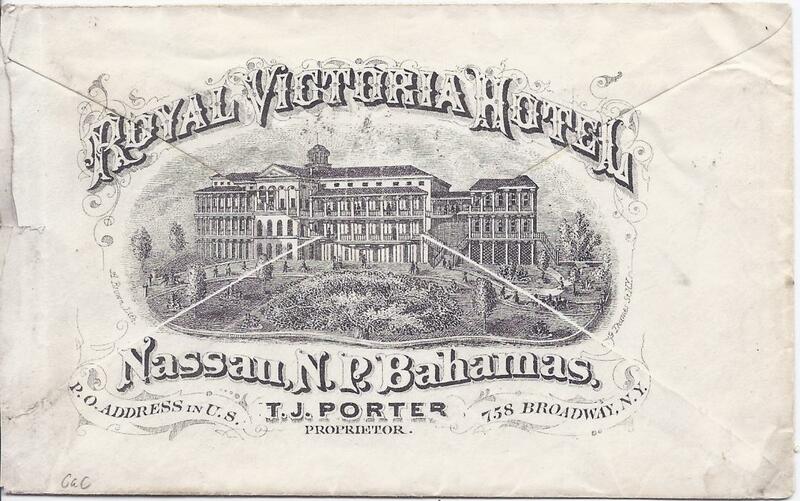 Including the letter written on Dec 23rd from Royal Victoria Hotel. 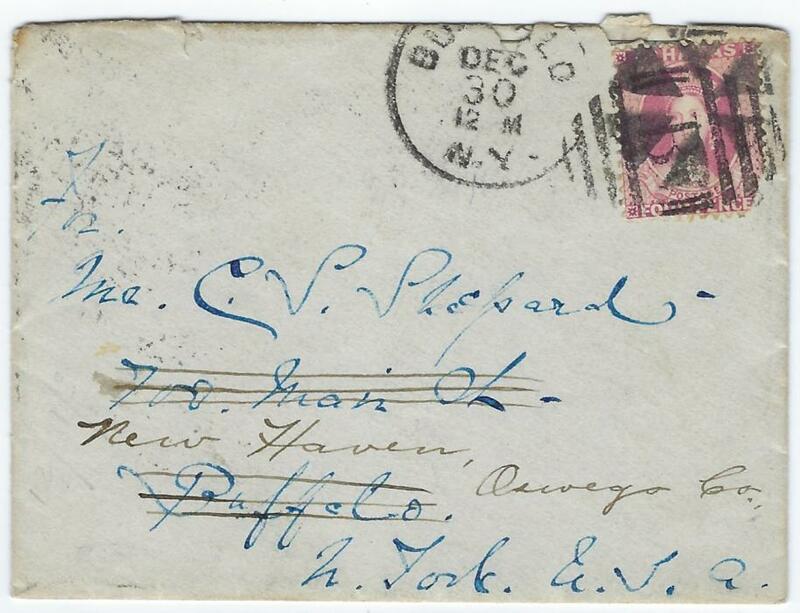 1886 cover to Pikesville, Maryland, USA bearing single franking 4d. deep yellow tied by �B� obliterator, reverse with B/Bahamas cds and New York �opera glasses� transit. 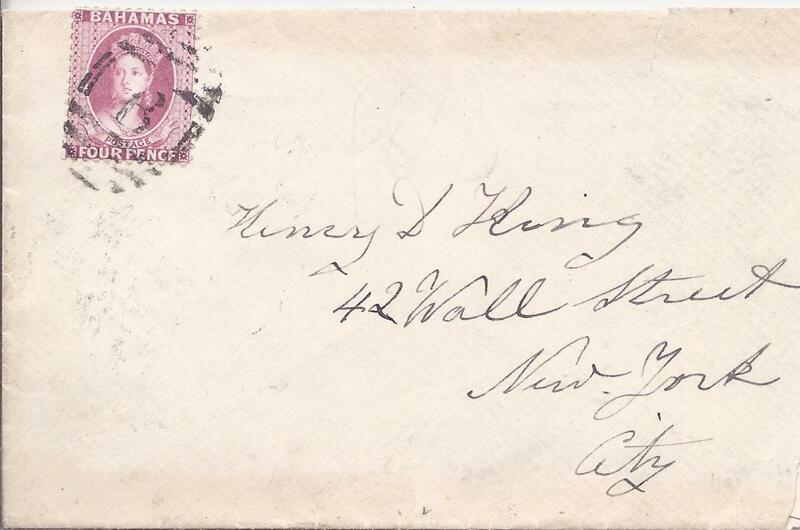 1887 cover to New York bearing single franking 4d., perf 12, tied by 'B' obliterator, reverse with Bahamas cds and New York Paid All 'opera glasses'arrival; very slightly reduced at right otherwise good clean example. 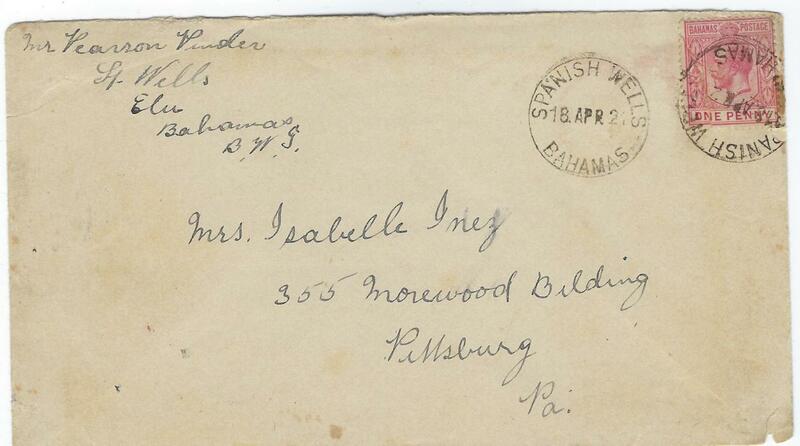 1889 'On Her Majesty's Service' registered cover to Heidelburg, Germany franked 1863-80 6d. and 1882 4d. cancelled 'B' obliterator, Registered Nassau cds in association at bottom left, London transit on front and arrival backstamp; fine and clean with BPA Certificate. 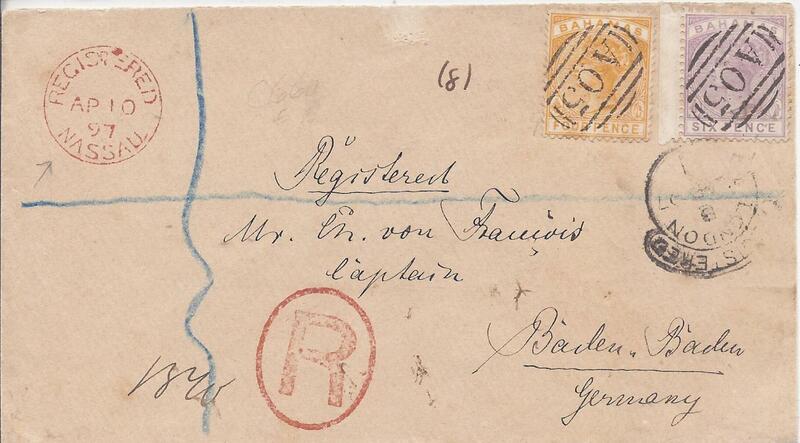 1897 registered cover to Germany franked 4d. and 6d. tied cancelled by fine �A05� obliterator, red framed �R� handstamp with Registered Nassau cds top left, London transit at right and Baden Baden arrival backstamp. 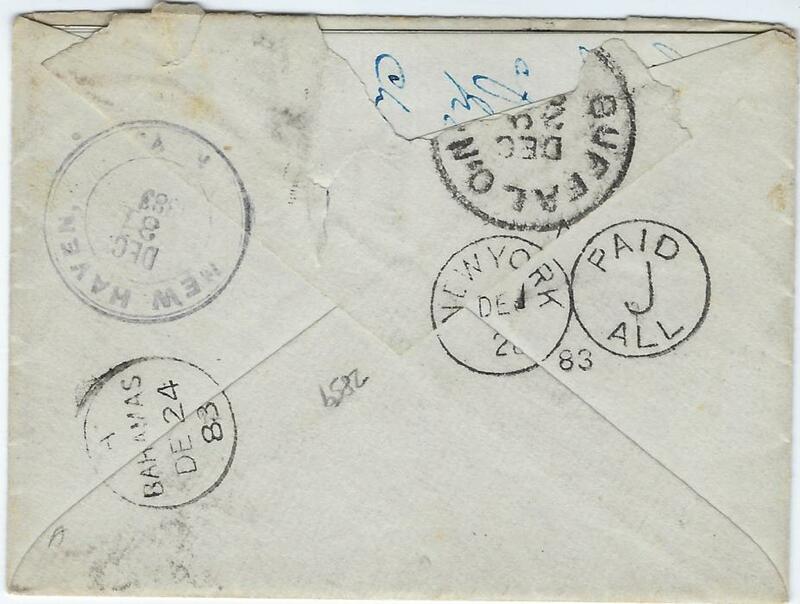 1920 (3 Mar) local cover bearing �Badge of Colony� set of 5 with each stamp tied by Nassau cds; fine condition. 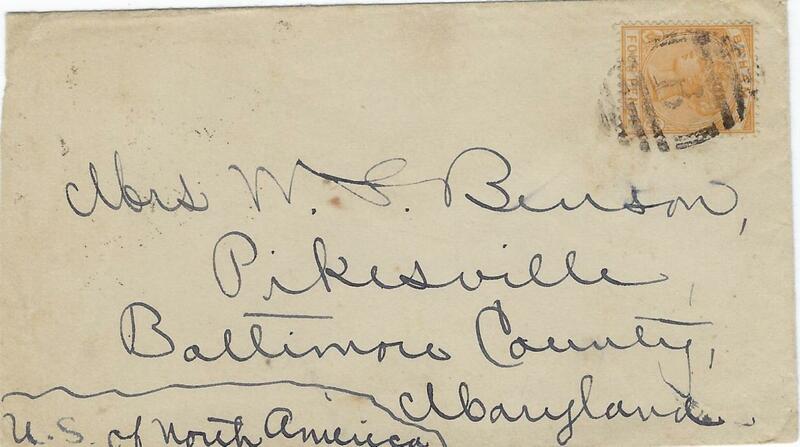 1921 cover to Pittsburg, USA bearing single franking 1d. tied by Spanish Wells cds with another fine strike alongside, maybe added as the first strike is upside down, reverse with Nasau transit. 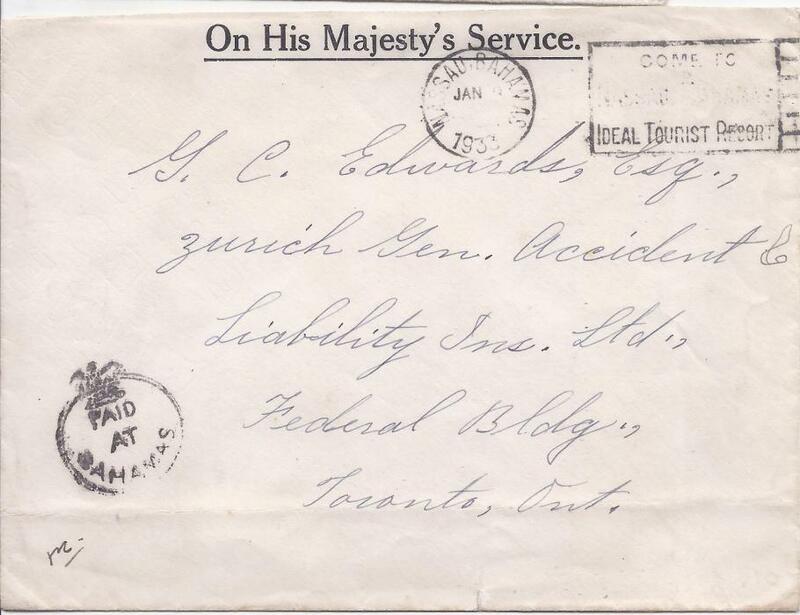 1933 OHMS envelope to Toronto, Canada, bearing Nassau slogan cancel and bearing late usage of the 'Crown circle' Paid at Bahamas.